The Nissan LEAF is having one heck of a year. It’s celebrating its fifth birthday, and Nissan is truly showing it knows how to party in style. 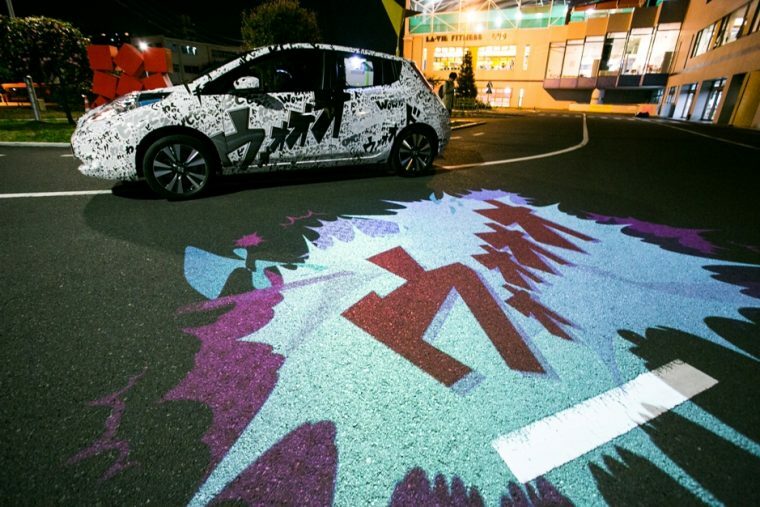 At a recent event in the Yokohama Minato Mirai area, Nissan turned the Nissan LEAF driving experience into a truly animated one. Drivers who participated in the drive were completely new to EVs, and were hooked into a headset that could measure their reactions to the drive by reading brainwaves. Alpha waves are emitted by the brain when it is relaxed and focus, whereas beta waves are generated when someone is excited or anxious. The headset sent readings to a system that interpreted the feelings coming from the drivers. Since this is Japan, Nissan could not stop there. After the emotions were interpreted by the system, projectors inside of the Nissan LEAF test vehicles would project images onto the street beside the car. There were more than 33 images that could be displayed, and they resembled those used in Japanese comics and cartoons (manga and anime) to convey strong emotions. It makes it look as if the very real Nissan LEAF is driving through a fantasy world. Only a guest appearance by Sailor Moon would make this experience any more Japanese. Take a look at the test drives below, and see how the drivers react to their first time behind the wheel. According to Nissan, 30 men and women completed the test drive and were monitored by Nissan. Let’s be honest, it would be pretty awesome to feel like you’ve been dropped into a comic for a nice drive. Maybe the program can come to America, with the artwork modified to feel like you’re driving through a Marvel comic.